← Welcome to the Minnesota Society of Costumers! Talk about inspiration! Cathy Hay is a designer in England who several years ago decided that working with brides every day was just not enough excitement for her. Instead she felt like she needed a personal challenge to test her skills and she decided that recreating a gown that she admired would be a good start. 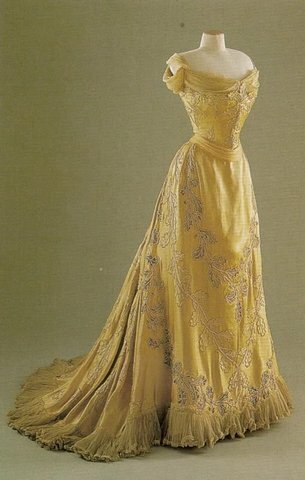 The gown she chose was the Oak Leaf gown as worn by Lady Curzon, and made by Charles Worth. And it was amazing. 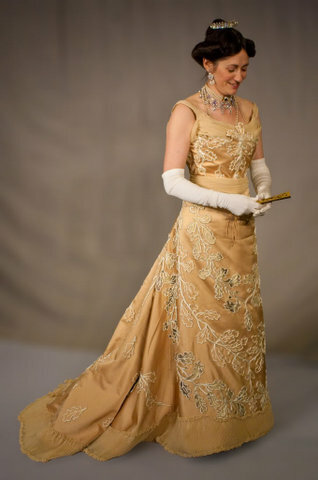 She wore the gown to Costume College in CA in 2009 and I was lucky enough to see it. The work that went into the gown was truly astonishing – she worked for hours every day for months to sew each of the leaves on by hand. After making something like that most folks would sit on their laurels and call it a day. Not Cathy. When she heard of the Hope For Haiti challenge she decided that she and her partner Demi Harman needed to participate. Which meant raising $14,000 to pay for their travel expenses and their participation in building a community center in Haiti. 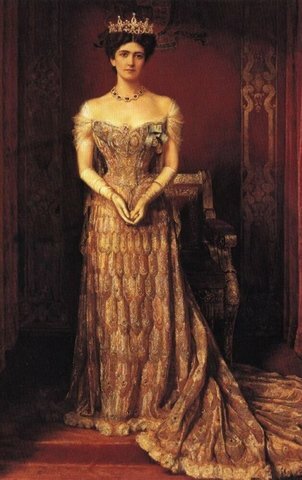 And when it came time to decide how they would raise the money, she decided to create another gown worn by Lady Curzon and designed by Worth: The Peacock Gown. But this isn’t just any gown. It weighs 10 lbs. and the entire thing is beaded and embroidered with goldwork and tiny little beetle wings. The amount of work involved would make even the most experienced of seamstresses falter. But Cathy is determined to do it, and she has come up with a brilliant plan to do so, and to raise money for Haiti. At $500 she will make the combination undergarments. At $1,000 she will make the first petticoat. And so on, and so on. At $14,000 raised she will make the entire gown, including the beaded shoes! She has managed to raise over $4,000 dollars, but still needs donations to meet her June deadline. And to keep herself honest, she has declared that she will wear as much of the finished outfit as has been pledged in donations to Costume College in 2012. Every person who donates will also have access to her private blog where she will be detailing the process of making the gown, much like the dress diary she wrote when working on the Oak Leaf Gown. Cathy has a site set up with more information on the project and on how you can donate. Help build a dress AND a community center. Check The Peacock Dress for more information.